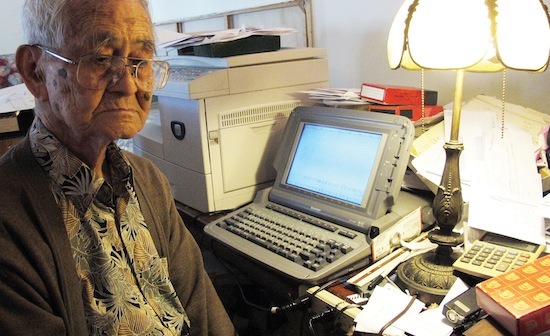 At 99, Masao Yamashiro reflects on a literary career that spans from Tule Lake to Rafu Shimpo. Trivia question: Who is the longest-running Rafu columnist? If readers answered George “Horse” Yoshinaga, they would be wrong. The answer is Masao Yamashiro, 98, who has been contributing a column to the Japanese section of The Rafu Shimpo since February 1970. As Yamashiro welcomes his 99th birthday in January, he reflects upon his life as a Kibei Nisei, his wartime experiences at the Tule Lake Segregation Center, and his literary career. Yamashiro was born on a plantation on the Hawaiian island of Kauai in 1916. When he was two years old, his father passed away during the 1918 Spanish flu pandemic, and when he was eight, his mother passed away from pneumonia. With both parents gone, Yamashiro, along with his older sister and younger brother, went to live with a paternal uncle in Okinawa. When Yamashiro arrived in Okinawa, he thought he knew how to speak a little Japanese but quickly found out he had a lot to learn. But Yamashiro quickly adjusted to life in Okinawa. It helped that his paternal uncle had children around his age and that they all got along. He also picked up a love of reading. “I read lots of literature,” said Yamashiro, who loved the works of Yasunari Kawabata, Junichiro Tanizaki and Naoya Shiga. When Yamashiro turned 16, he returned to his birthplace, Hawaii. By that time, Yamashiro had forgotten his English, so his job prospects were limited, and he ended up working for a cousin who managed a pineapple plantation on Kauai. After two years, however, Yamashiro realized he was not going to learn English working in the pineapple fields, so he made his way to Honolulu, where he enrolled in school and supported himself doing all sorts of odd jobs, such as washing dishes, helping the cook, and waiting tables. A copy of “Tessaku,” a literary journal published in Tule Lake. The journal kept to non-political topics but was still monitored by U.S. governmental authorities. In 1936, he ventured out to Los Angeles, where he had another cousin. He found work in the downtown produce market and enrolled at Polytechnic High School, which was one of the few high schools offering special English classes for adults. It was not surprising, then, that Polytechnic High had a large Kibei student population. Yamashiro recalled enduring a lot of anti-Japanese rhetoric at that time, and seeing, almost on a daily basis, anti-Japanese headlines splashed across the mainstream newspapers. When a “Keep California White” campaign rose up, Yamashiro recalled, the Japanese American community tried to counter it with a “Keep California Green” campaign since most Nikkei were farmers, flower growers or gardeners. Yamashiro graduated from Polytechnic High in three years and went on to Los Angeles City College. His plan was to transfer to UCLA after two years, but the war broke out. While at City College, he majored in English literature and even had one of his short stories published in the school literary journal. When Japan attacked Pearl Harbor on Sunday, Dec. 7, 1941, Yamashiro was at a Kibei Nisei gathering at the Los Angeles Betsuin Hompa Hongwanji temple (also referred to as Nishi Hongwanji). At that time, Yamashiro was working as a “schoolboy” (houseboy), but the heightened anti-Japanese sentiment after Pearl Harbor propelled him to quit Los Angeles City College and leave his Caucasian employer. “My brother was afraid that his work with the U.S. military intelligence might get his relatives in Okinawa into trouble, so he changed his name to Sankey,” explained Yamashiro. When the government ordered all Japanese Americans on the West Coast to enter camps, Yamashiro was first sent to the Santa Anita Assembly Center, where he lived with his cousin in the newer barracks built on the parking lot of the horse racing facility. From Santa Anita, he was shipped to the Amache (Granada) War Relocation Authority (WRA) camp in Colorado. He did request and was granted permission to visit the Heart Mountain WRA camp in Wyoming. “We visited Rev. Senzaki Nyogen. He was my teacher, and we respected him so we visited him at Heart Mountain,” said Yamashiro, who was in search for some direction. When the so-called loyalty questionnaire came out in early 1943, Yamashiro answered “no-yes” to Questions 27 and 28, the two most controversial questions, and was shipped to the Tule Lake Segregation Center in Northern California. At Tule Lake, Yamashiro met like-minded literary writers and felt the desire to write again. The group usually gathered at the barrack of Bunichi Kagawa, a well-known Issei poet. That fall, Yamashiro, Kagawa, Jyoji Nozawa and Kazuo Kawai decided to publish a literary journal in the Japanese language. Although Kagawa was the most prominent writer among the four, Yamashiro, Nozawa and Kawai became the official co-editors since they held U.S. citizenship, which they hoped would help them avoid problems with the WRA. “Mr. Bunichi Kagawa was an Issei, and we didn’t want him to get into trouble, so we Kibei Nisei, who held American citizenship, became the editors – me, Mr. Nozawa and Mr. Kawai,” recalled Yamashiro. They chose “Tessaku” as the literary journal’s title. “Tessaku” translates to “Iron Fence” (from “tetsu,” iron, and “saku,” fence). From the beginning, the group announced that “Tessaku” would not accept any political pieces. For a submission to get published, Yamashiro recalled, all three editors had to read the submission and agree on publication. Yamashiro sits at his word processor at his home in West Los Angeles. The three underwent intense questioning that ranged from who owned shortwave radios to who murdered Hitomi, the cooperative manager. In addition to editorial policy issues, the three had to worry about more practical matters such as lack of paper. Fortunately, Nozawa had a contact who was working in the camp bookstore and was able to purchase paper for the group. Eight hundred copies of the first volume were printed with a mimeograph machine and sold for 25 cents each at the camp canteen. Junko Kobayashi, in her doctoral dissertation on bicultural literature, noted that Satae Shinoda, a leading scholar who has researched Japanese American literature written in Japanese, deemed “Tessaku” as the best literary publication in Japanese to come out of the World War II camps. Other than his literary activities, Yamashiro kept to himself. He did not join — nor did he have a desire to join — the Sokuji Kikoku Hoshi Dan (Organization to Return Immediately to the Homeland to Serve) or Hoshidan for short. Yamashiro’s philosophy was to stay quiet until the war was over. He felt the Hoshidan members were unnecessarily flaunting their love of Japan. 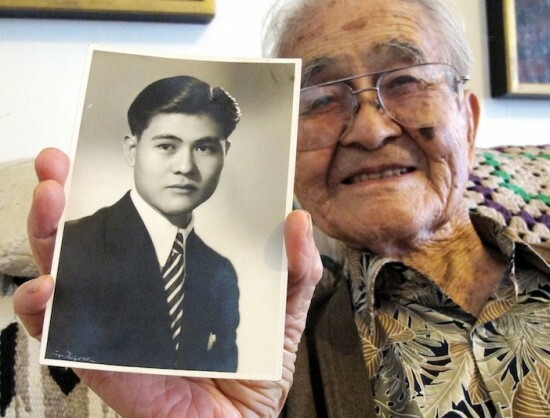 He pointed to a 1935 legal victory in Hawaii, where a Japanese American sued the Hawaiian government for trying to stop the teaching of the Japanese language. 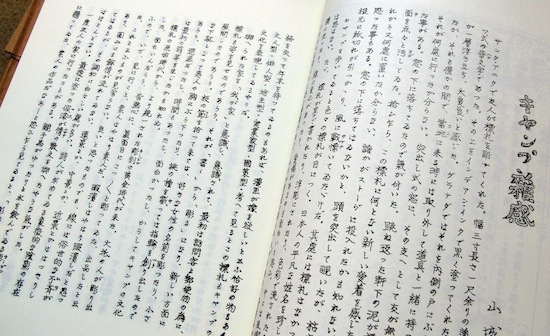 The Nikkei victory hinged on the argument that while teaching politics in Japanese might be problematic, teaching the Japanese culture was not against the law. Yamashiro used this same argument when he was going into the Santa Anita Assembly Center, and thus was able to openly bring Japanese language books into camp. When the issue of renunciation came up at Tule Lake, Yamashiro did not volunteer information on his citizenship status because he feared violence from the pressure groups that the WRA was allowing to run rampant in camp. The U.S. government’s tactic was to allow free rein to the pressure groups so as to have as many Japanese Americans as possible renounce their U.S. citizenship, which in turn would allow the government to deport renunciants to Japan legally. As more Tuleans renounced their U.S. citizenship and prepared to go to Japan, there was a demand for Japanese language instructors to prepare the American-born Nisei for Japan. Yamashiro signed up to be an instructor. When the war ended, Yamashiro made an announcement to his students on the last day of school. “After I said my goodbyes, I told the students I didn’t renounce my U.S. citizenship,” he said. “It got quiet, you know. Then I told them the reason I didn’t tell anyone was because I was scared I’d get beaten up. After the war, Yamashiro, like many Nikkei, became a gardener, but he continued writing on his free time. He also married Shizue Saito in 1963. He was first introduced to Shizue through her painting when he bought one of her works through an artist friend, Sen Kurihara, who thought Yamashiro needed a spouse and that Shizue would be perfect for him. Shizue Yamashiro shows some of her paintings. Married in 1963, the couple support one another’s creative endeavours. Kurihara approached Shizue, who lived in Japan, about a marriage prospect, but she was not interested in moving across the Pacific. Undaunted, Yamashiro started corresponding with her. Thus, after a year of letter-writing, Yamashiro took the next big step and flew to Japan. When he proposed, Shizue accepted. Yamashiro took Shizue to the U.S. Embassy in Tokyo to get married. An official working at the embassy told him that all Nisei born in the U.S. before 1934 had automatic dual citizenship, he should go to Okinawa to get his Japanese birth certificate. “I thought I was going to get married as an American, but I was told I was marrying as a Japanese,” said Yamashiro, chuckling. After the couple married, Yamashiro was directed by a Japanese official to renounce his Japanese citizenship once he returned to the U.S. Through the years, Yamashiro supported his wife’s painting, and Shizue supported her husband’s writing. Yamashiro’s column in The Rafu’s Japanese section is titled “Kobuta Kai ni” or “To go buy a piglet,” which is layered with different meanings. He explained that on one level it describes how he has not fully developed or attained perfection since he must metaphorically raise the piglet and that he himself is like the maturing piglet. On another level, he shared that the phrase was an inside joke among Okinawans. According to Yamashiro, when Okinawa was still the independent Kingdom of Ryukyu, families had to bring an offering of a pig to the Ryukyu king. After the fall of the Ryukyu kingdom to Japan, Okinawan families no longer had to make that offering, but if an Okinawan was planning to venture to mainland Japan, they joked that he/she was going over to buy a pig. In addition to being a regular Rafu columnist for more than 40 years, Yamashiro has written two books published in Japanese. The first book is titled “Tooi Taigan” (The Far Opposite Shores) and is a compilation of his columns that doubles as a memoir. The second book, titled “Kibei,” explores the dual and conflicting worlds that the Kibei grew up in. The cover for “Kibei” displays one of Shizue’s paintings. Shizue, meanwhile, has made a name for herself in her own right. She has held a number of exhibitions of her paintings in the U.S. and Japan. Her works have been shown in various venues such as the Janet Gallery, the Japanese American Cultural and Community Center, UCLA, Yoseido, and Matsuzaka-ya, to name a few. 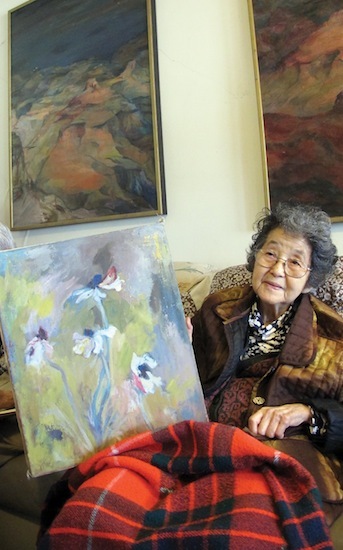 Today, Shizue, 93, like her husband, has slowed down, especially since a slight stroke has affected her ability to paint, but the couple still maintains a creative lifestyle. A doctoral dissertation, “Bittersweet Home: Celebration of Biculturalism in Japanese Language Japanese American Literature, 1936-1952” by Junko Kobayashi, contributed to this story.